By ignoring the wisdom of old adages and judging by its cover alone one might be forgiven for thinking this book was aimed at younger readers but, in fact, it is a wonderful and in-depth examination of every aspect of the Inca civilization of ancient Peru. It may not have the gravitas of more academic treatments of the subject but it certainly presents a detailed and fascinating insight into one of history's most unique cultures. Jam-packed with wonderful photographs (over 1,000 and all in colour) of sites and artefacts, the book has merit merely as a pretty adornment to any coffee table but spread over its 500-plus pages is so much factual information that it is a welcome addition to any library on the Incas. Indeed, many of the topics examined by Dr. Jones are hard to find in other works, for example, such themes as Inca metalwork, sculpture, pottery, mummification, and aspects of daily life. There are also, of course, in-depth sections on the facets of Inca culture for which they have become most famous - their sun-worship, architecture, textiles, and final collapse. The civilizations of the Andes which preceded the Incas are not neglected either and there are plenty of sections on the Moche, Chavin, and Nazca cultures, for example. Useful timeline pages which compare contemporary Andean civilizations and a plethora of maps help to orientate the reader through the history of the region and there is a good index too for those wishing to read up on specific areas. The only quibble with this excellent book is that it was originally published in two volumes and so in this single-volume hard-back version, which seems to have merely stuck the two originals together, one after the other, there is some repetition of content so that it is best read by sections rather than from cover to cover. 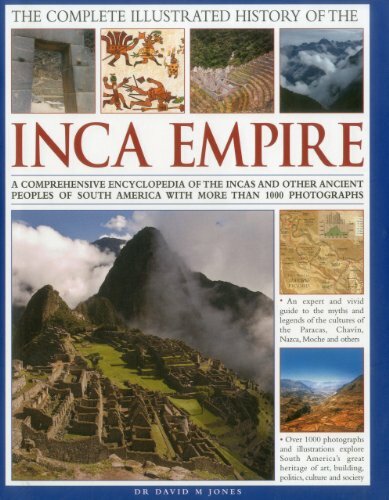 In summary, this is a fine volume, very reasonably priced considering its number of photos and glossy paper, and a wonderfully accessible presentation of the Incas. I for one will be buying other books in this series. Jones, David M. "The Complete Illustrated History of the Inca Empire." Ancient History Encyclopedia. Last modified April 03, 2015. https://www.ancient.eu/review/72/. Jones, David M. "The Complete Illustrated History of the Inca Empire." Ancient History Encyclopedia. Ancient History Encyclopedia, 03 Apr 2015. Web. 23 Apr 2019.